A healthy diet is important to the maintenance of good general health. An imbalanced diet can increase risk for the development of obesity and insulin resistance which can eventually lead to the onset of diabetes. Nutrition, obesity, and diabetes are all known risk factors for periodontal diseases. Periodontitis in turn is a risk factor for the development of diabetes and can complicate the management of those who suffer from obesity and/or diabetes. The interplay of these three common chronic inflammatory diseases suggests that a syndemic approach to prevention and management would best address the shared risk for all of these diseases and help to break the cycle of pro-inflammatory events leading to chronic inflammation as assessed by elevations in C-reactive protein, driven by elevations in cytokines such as IL-6 and TNF-α as well as oxidative stress. These interactions may synergistically increase risk for cardiovascular disease, the number one cause of death worldwide. 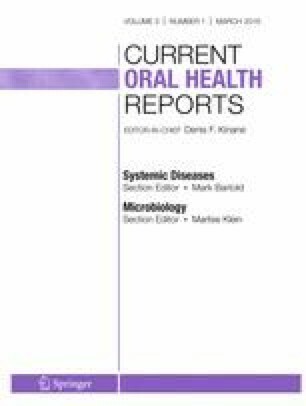 Oral health care providers can play a major role, as members of an interdisciplinary team of healthcare providers, in addressing this syndemic. Veena Raja declares that she has no conflict of interest. Maria Emanuel Ryan is a co-inventor on issued patents to prevent long-term complications of diabetes and to inhibit glycation proteins with tetracycline compounds. In addition, the host modulatory therapy Periostat (subantimicrobial dose doxycycline) was developed at Stony Brook University in the Department of Oral Biology and Pathology.